This marker indicating sea level is situated between Jerusalem and the Dead Sea, Israel. Sea level is generally used to refer to mean sea level (MSL), an average level for the surface of one or more of Earth's oceans from which heights such as elevations may be measured. MSL is a type of vertical datum – a standardised geodetic reference point – that is used, for example, as a chart datum in cartography and marine navigation, or, in aviation, as the standard sea level at which atmospheric pressure is measured in order to calibrate altitude and, consequently, aircraft flight levels. A common and relatively straightforward mean sea-level standard is the midpoint between a mean low and mean high tide at a particular location. Sea levels can be affected by many factors and are known to have varied greatly over geological time scales. The careful measurement of variations in mean sea levels can offer information about climate change and has been interpreted as evidence supporting the view that the current rise in sea levels is an indicator of global warming. The term above sea level generally refers actually to above mean sea level (AMSL). Precise determination of a "mean sea level" is a difficult problem because of the many factors that affect sea level. Sea level varies quite a lot on several scales of time and distance. This is because the sea is in constant motion, affected by the tides, wind, atmospheric pressure, local gravitational differences, temperature, salinity and so forth. The best one can do is to pick a spot and calculate the mean sea level at that point and use it as a datum. For example, a period of 19 years of hourly level observations may be averaged and used to determine the mean sea level at some measurement point. In the UK, the Ordnance Datum (the 0 metres height on UK maps) is the mean sea level measured at Newlyn in Cornwall between 1915 and 1921. Prior to 1921, the datum was MSL at the Victoria Dock, Liverpool. In France, the Marégraphe in Marseilles measures continuously the sea level since 1883 and offers the longest collapsed data about the sea level. It is used for a part of continental Europe and main part of Africa as official sea level.Elsewhere in Europe vertical elevation references (European Vertical Reference System) are made to the Amsterdam Pile elevation, which dates back to the 1690s. Height above mean sea level (AMSL) is the elevation (on the ground) or altitude (in the air) of an object, relative to the average sea level datum. AMSL height is used extensively in radio (both in broadcasting and other telecommunications uses) to determine the coverage area a station will be able to reach. It is also used in aviation, where some heights are recorded and reported with respect to mean sea level (MSL) (contrast with flight level), and in the atmospheric sciences, and land surveying. An alternative is to base height measurements on an ellipsoid of the entire earth, which is what systems such as GPS do. In aviation, the ellipsoid known as World Geodetic System 84 is increasingly used to define heights, however, differences up to 100 metres (328 feet) exist between this ellipsoid height and mean tidal height. The alternative is to use a geoid based vertical datum such as NAVD88. When referring to geographic features such as mountains on a topographic map, variations in elevation are shown by contour lines. The elevation of a mountain denotes the highest point or summit and is typically illustrated as a small circle on a topo map with the AMSL height shown in either metres or feet or both. In the rare case that a location is below sea level, the elevation AMSL is negative. For one such case see Amsterdam Airport Schiphol. Various factors affect the volume or mass of the ocean, leading to long-term changes in eustatic sea level. The primary influence is that of temperature on seawater density and the amounts of water retained in rivers, aquifers, lakes, glaciers, polar ice caps and sea ice. Over much longer geological timescales, changes in the shape of the oceanic basins and in land/sea distribution will also affect sea level. Observational and modelling studies of mass loss from glaciers and ice caps indicate a contribution to sea-level rise of 0.2 to 0.4 mm/yr averaged over the 20th century. 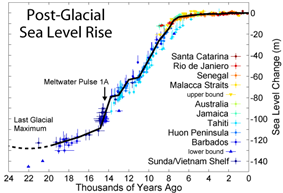 Over this last million years, whereas it was higher most of the time before then, sea level was lower than today. 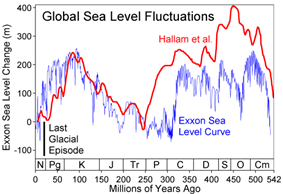 Sea level reached 120 meters below current sea level at the Last Glacial Maximum 19,000–20,000 years ago. Each year about 8 mm (0.3 inches) of water from the entire surface of the oceans falls onto the Antarctica and Greenland ice sheets as snowfall. If no ice returned to the oceans, sea level would drop 8 mm (0.3 in) every year. To a first approximation, the same amount of water appeared to return to the ocean in icebergs and from ice melting at the edges. Scientists previously had estimated which is greater, ice going in or coming out, called the mass balance, important because it causes changes in global sea level. High-precision gravimetry from satellites in low-noise flight has since determined that in 2006, the Greenland and Antarctic ice sheets experienced a combined mass loss of 475 ± 158 Gt/yr, equivalent to 1.3 ± 0.4 mm/yr sea level rise. Notably, the acceleration in ice sheet loss from 1988–2006 was 21.9 ± 1 Gt/yr² for Greenland and 14.5 ± 2 Gt/yr² for Antarctica, for a combined total of 36.3 ± 2 Gt/yr². This acceleration is 3 times larger than for mountain glaciers and ice caps (12 ± 6 Gt/yr²). Ice shelves float on the surface of the sea and, if they melt, to first order they do not change sea level. Likewise, the melting of the northern polar ice cap which is composed of floating pack ice would not significantly contribute to rising sea levels. However, because floating ice pack is lower in salinity than seawater, their melting would cause a very small increase in sea levels, so small that it is generally neglected. Scientists previously lacked knowledge of changes in terrestrial storage of water. Surveying of water retention by soil absorption and by artificial reservoirs ("impoundment") show that a total of about 10,800 cubic kilometres (2,591 cubic miles) of water (just under the size of Lake Huron) has been impounded on land to date. Such impoundment masked about 30 mm (1.2 in) of sea level rise in that time. Conversely estimates of excess global groundwater extraction during 1900–2008 totals ∼4,500 km3, equivalent to a sea-level rise of 12.6 mm (0.50 in) (>6% of the total). Furthermore, the rate of groundwater depletion has increased markedly since about 1950, with maximum rates occurring during the most recent period (2000–2008), when it averaged ∼145 km3/yr (equivalent to 0.40 mm/yr of sea-level rise, or 13% of the reported rate of 3.1 mm/yr during this recent period). If small glaciers and polar ice caps on the margins of Greenland and the Antarctic Peninsula melt, the projected rise in sea level will be around 0.5 m (1 ft 7.7 in). Melting of the Greenland ice sheet would produce 7.2 m (23.6 ft) of sea-level rise, and melting of the Antarctic ice sheet would produce 61.1 m (200.5 ft) of sea level rise. The collapse of the grounded interior reservoir of the West Antarctic Ice Sheet would raise sea level by 5 m (16.4 ft) - 6 m (19.7 ft). The snowline altitude is the altitude of the lowest elevation interval in which minimum annual snow cover exceeds 50%. This ranges from about 5,500 metres (18,045 feet) above sea-level at the equator down to sea level at about 70° N&S latitude, depending on regional temperature amelioration effects. Permafrost then appears at sea level and extends deeper below sea level polewards. 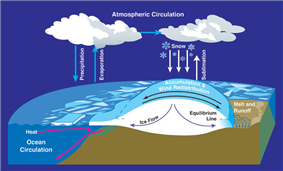 Climate changes during the 20th century are estimated from modelling studies to have led to contributions of between −0.2 and 0.0 mm/yr from Antarctica (the results of increasing precipitation) and 0.0 to 0.1 mm/yr from Greenland (from changes in both precipitation and runoff). At times during Earth's long history, the configuration of the continents and sea floor have changed due to plate tectonics. This affects global sea level by altering the depths of various ocean basins and also by altering glacier distribution with resulting changes in glacial-interglacial cycles. Changes in glacial-interglacial cycles are at least partially affected by changes glacier distributions across the Earth. The depth of the ocean basins is a function of the age of oceanic lithosphere (the tectonic plates beneath the floors of the world's oceans). As older plates age, they becomes denser and sink, allowing newer plates to rise and take their place. Therefore, a configuration with many small oceanic plates that rapidly recycle the oceanic lithosphere would produce shallower ocean basins and (all other things being equal) higher sea levels. A configuration with fewer plates and more cold, dense oceanic lithosphere, on the other hand, would result in deeper ocean basins and lower sea levels. When there was much continental crust near the poles, the rock record shows unusually low sea levels during ice ages, because there was much polar land mass on which snow and ice could accumulate. During times when the land masses clustered around the equator, ice ages had much less effect on sea level. Over most of geologic time, the long-term mean sea level has been higher than today (see graph above). Only at the Permian-Triassic boundary ~250 million years ago was the long-term mean sea level lower than today. Long term changes in the mean sea level are the result of changes in the oceanic crust, with a downward trend expected to continue in the very long term. During the glacial-interglacial cycles over the past few million years, the mean sea level has varied by somewhat more than a hundred metres. This is primarily due to the growth and decay of ice sheets (mostly in the northern hemisphere) with water evaporated from the sea. During the most recent ice age (at its maximum about 20,000 years ago) the world's sea level was about 130 m lower than today, due to the large amount of sea water that had evaporated and been deposited as snow and ice, mostly in the Laurentide ice sheet. Most of this had melted by about 10,000 years ago. 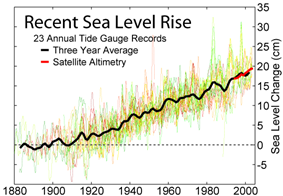 For at least the last 100 years, sea level has been rising at an average rate of about 1.8 mm (0.1 in) per year. Most of this rise can be attributed to the increase in temperature of the sea and the resulting slight thermal expansion of the upper 500 metres (1,640 feet) of sea water. Additional contributions, as much as one-fourth of the total, come from water sources on land, such as melting snow and glaciers and extraction of groundwater for irrigation and other agricultural and human needs. (see global warming). Using pressure to measure altitude results in two other types of altitude. Distance above true or MSL (mean sea level) is the next best measurement to absolute. Above mean sea level is abbreviated as AMSL. MSL altitude is the distance above where sea level would be if there were no land. If one knows the elevation of terrain, the distance above the ground is calculated by a simple subtraction. An MSL altitude—called pressure altitude by pilots—is useful for predicting physiological responses in unpressurised aircraft (see hypoxia). It also correlates with engine, propeller and wing performance, which all decrease in thinner air. Pilots can estimate height above terrain with an altimeter set to a defined barometric pressure. Generally, the pressure used to set the altimeter is the barometric pressure that would exist at MSL in the region being flown over. This pressure is referred to as either QNH or "altimeter" and is transmitted to the pilot by radio from air traffic control (ATC) or an Automatic Terminal Information Service (ATIS). Since the terrain elevation is also referenced to MSL, the pilot can estimate height above ground by subtracting the terrain altitude from the altimeter reading. Aviation charts are divided into boxes and the maximum terrain altitude from MSL in each box is clearly indicated. Once above the transition altitude (see below), the altimeter is set to the international standard atmosphere (ISA) pressure at MSL which is 1013.25 hPa or 29.92 inHg. MSL is useful for aircraft to avoid terrain, but at high enough altitudes, there is no terrain to avoid. Above that level, pilots are primarily interested in avoiding each other, so they adjust their altimeter to standard temperature and pressure conditions (average sea level pressure and temperature) and disregard actual barometric pressure—until descending below transition level. To distinguish from MSL, such altitudes are called flight levels. Standard terminology is to express flight level as hundreds of feet, so FL 240 is 24,000 feet (7,300 m). Pilots use the international standard pressure setting of 1013.25 hPa (29.92 inHg) when referring to flight levels. The altitude at which aircraft are mandated to set their altimeter to flight levels is called "transition altitude". It varies from country to country. For example in the U.S. it is 18,000 feet, in many European countries it is 3,000 or 5,000 feet. ^ Rignot, Eric; I. Velicogna, M. R. van den Broeke, A. Monaghan, J. T. M. Lenaerts (March 2011). "Acceleration of the contribution of the Greenland and Antarctic ice sheets to sea level rise". Geophysical Research Letters 38 (5). ^ Chao, B. F.; Y. H. Wu; Y. S. Li (April 2008). "Impact of Artificial Reservoir Water Impoundment on Global Sea Level". Science 320 (5873): 212–214. ^ Konikow (September 2011). "Contribution of global groundwater depletion since 1900 to sea-level rise". Geophysical research letters 38 (17). ^ "Climate Change 2001: The Scientific Basis". ^ Müller, R. Dietmar; et al. (2008-03-07). "Long-Term Sea-Level Fluctuations Driven by Ocean Basin Dynamics". ^ Shepherd, Andrew; Ivins ER, A G, Barletta VR, Bentley MJ, Bettadpur S, Briggs KH, Bromwich DH, Forsberg R, Galin N, Horwath M, Jacobs S, Joughin I, King MA, Lenaerts JT, Li J, Ligtenberg SR, Luckman A, Luthcke SB, McMillan M, Meister R, Milne G, Mouginot J, Muir A, Nicolas JP, Paden J, Payne AJ, Pritchard H, Rignot E, Rott H, Sørensen LS, Scambos TA, Scheuchl B, Schrama EJ, Smith B, Sundal AV, van Angelen JH, van de Berg WJ, van den Broeke MR, Vaughan DG, Velicogna I, Wahr J, Whitehouse PL, Wingham DJ, Yi D, Young D, Zwally HJ. (Nov 30, 2012). "A reconciled estimate of ice-sheet mass balance.". Science 338 (6111): 1183–1189. ^ Haq, B. U.; Schutter, SR (2008). "A Chronology of Paleozoic Sea-Level Changes". Science 322 (5898): 64–8. ^ Bruce C. Douglas (1997). "Global Sea Rise: A Redetermination". Surveys in Geophysics 18 (2/3): 279–292. ^ Bindoff, N.L. ; Willebrand, J.; Artale, V.; Cazenave, A.; Gregory, J.; Gulev, S.; Hanawa, K.; Le Quéré, C.; Levitus, S.; Nojiri, Y.; Shum, C.K. ; Talley, L.D. ; Unnikrishnan, A. (2007). "Observations: Oceanic Climate Change and Sea Level". In Solomon, S.; Qin, D.; Manning, M.; Chen, Z.; Marquis, M.; Averyt, K.B. ; Tignor, M.; Miller, H.L. Climate Change 2007: The Physical Science Basis. Contribution of Working Group I to the Fourth Assessment Report of the Intergovernmental Panel on Climate Change. Cambridge University Press.